Panasonic has introduced the new LUMIX G9 mirrorless camera, designed for professional stills photographers, offering the highest image quality in LUMIX history, notes Panasonic. The 20.3-megapixel G9 features 20 fps high-speed burst shooting and a huge 3,680K-dot OLED Live View Finder. Look for our field test as soon as we have a review copy in our hands. One of the many highlights of the new G9 is the camera’s 80-megapixel High-Resolution mode. If shooting conditions warrant more than those 20+ megapixels, the G9 has the ability to shift its sensor to produce “an 80-megapixel equivalent (10368 x 7776) image by synthesizing 8 consecutively shot images.” Both JPEG and RAW images can be shot in-camera without requiring software processing. 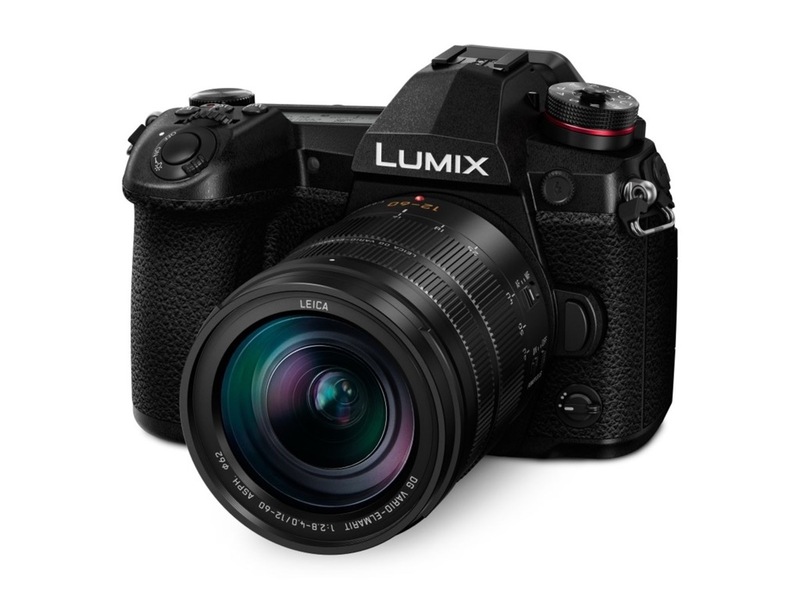 Image stabilization has been improved with the G9, as photographers will see 6.5 stops of shake reduction shooting with or without compatible image-stabilized LUMIX lenses. And Panasonic’s DFD (Depth From Defocus) technology, in combination with Contrast AF, helps to deliver fast, precise autofocus. As for video, with the G9, creatives can shoot UHD 4K at up to 60 fps, and slow-motion at up to 60 fps in 4K and 180 fps in Full HD. Both 6K and 4K stills can be captured through the camera’s video functionality, as well. Splash-proof, dust-proof and freeze-proof down -10º C, the G9 body is built from a magnesium alloy, making it suitable for location work. The rear monitor features a 3-inch LCD, with 1,040K-dot high resolution. The camera has two SD memory card slots, which support UHS-II, and it has Bluetooth and WiFi connectivity. The optional DMW-BGG9 battery grip ($349.99) is designed especially for the G9, which extends battery life—and shooting time—by using the battery in the camera and the battery in the grip. Priced at $1,699.99 (body only), the LUMIX G9 is slated for early January 2018 delivery. Panasonic is accepting pre-orders now. The high-speed, high-precision AF with DFD technology achieves the world’s fastest*1AF speed of 0.04 sec*2. With its high-tracking performance to the subject, the LUMIX G9 does not lose the target subject. The LUMIX G9 also boasts the fastest-in-class*3 20 fps (AFC) / 60 fps (AFS) in 20.3-megapixel full resolution to capture those unmissable moments. Complying with 6K/4K PHOTO, users can choose the most suitable burst shooting mode in addition to the regular consecutive shooting mode and the new pre-burst shooting mode. To withstand heavy field use, the LUMIX G9 is composed of a magnesium alloy full die-cast front / rear frame and is not only splash-proof*5 and dust-proof but also freeze proof down to -10 degrees centigrade. The largest-in-class Status LCD on the top of the camera makes shooting even easier and more comfortable. For the rear monitor, a 3.0-inch free-angle LCD in 3:2 aspect ratio with 1,040K-dot high resolution is equipped. The G9 has a double SD Memory Card slot, compatible with the high-speed, high-capacity UHS-II. The new High Resolution mode produces an 80-megapixel equivalent (10368 x 7776) image by synthesizing 8 consecutively shot images while shifting the sensor. Not only JPEG but also RAW can be produced in the camera, without the need for software processing. These magnificently high resolution capabilities are ideal for landscape and product photography using a tripod. To achieve stable handheld shooting even in slower shutter speed, the Body I.S. (Image Stabilizer) in the LUMIX G9 is further advanced. Panasonic adopted a newly developed algorithm that precisely calculates shake information acquired not only from a gyro sensor, but also from the image sensor and accelerometer sensor. This enables more accurate shake detection and compensation, making it possible to use a 6.5-stop slower shutter speeds*1. Notably, movement with characteristically low frequency is suppressed more effectively to use slower shutter speeds. With its high mobility achieved by the compact, lightweight design and powerful Body I.S., this LUMIX G Digital Single Lens Mirrorless Camera makes previously impossible shooting, such as handheld 800mm (35mm camera equivalent) ultra-telephoto shooting, possible. Combining B.I.S. (Body Image Stabilizer, 5-axis) and O.I.S. (Optical Image Stabilizer, 2-axis), the 5-axis Dual I.S. (Image Stabilizer) 2*2in the LUMIX G9 compensates for larger movements that were conventionally uncontrollable. Maximizing both O.I.S and B.I.S. is highly beneficial in telephoto shots and in adverse situations, such as at night or with one-handed shooting with a 6.5-stop slower shutter speed*3. The DFD (Depth From Defocus) technology*1calculates the distance to the subject by evaluating two images with different sharpness levels and instantly consulting the optical characteristics data of the current lens. Panasonic’s combination of the Contrast AF with DFD technology was further advanced in the LUMIX G9 together with the speed of the sensor drive during auto focusing in photo shooting, which achieves 480 fps. Consequently, the LUMIX G9 realizes an ultra-high-speed AF of approximately 0.04 sec*2and 60 (AFS) / 20(AFC) fps high-speed burst shooting using an electronic shutter at full resolution. The LUMIX G9 boasts outstanding performance to achieve the fastest-in-class*120 fps (AFC) / 60 fps (AFS) at 20.3-megapixel full resolution. Taking advantage of its blackout-free LVF (Live View Finder), it is the best mirrorless camera for capturing moving subjects in sharp focus. With its high tracking performance to the subject, the LUMIX G9 doesn’t lose the target subject. Pre-burst shooting is also new on LUMIX G9, which starts shooting 0.4 sec in advance to releasing the shutter. The LVF (Live View Finder) is the key factor for completing the ultra-high-speed response of the camera. The LUMIX G9 has the largest-in-class LVF with a stunningly high magnification ratio of approx.1.66x / 0.83x (35mm camera equivalent). The magnification ratio can be switched between 0.7x, 0.77x and 0.83x according to the shooting situation. High-precision, high-speed OLED (Organic Light-Emitting Diode) display features 3,680K-dot high resolution and 100% field of view. Adoption of OLED for the LVF achieves smooth display at 120 fps and high speed response with minimum time lag of less than 0.005 sec as well as 10,000:1 high contrast for exceptional visibility. No blackout occurs even in high speed burst shooting, so as not to lose sight of the subject. With an eye point of approximately 21 mm, it offers high visibility with comfort for users wearing glasses. It is always sharp and clear from the center all the way to the corners. The LUMIX G9 incorporates Night mode which provides mild backlighting. It lets the user watch the subject comfortably immediately after viewing the monitor while in a dark situation for a long period of time. The LUMIX G9 is equipped with a double SD Memory Card slot compatible with high-speed, high capacity UHS-II. Users can flexibly choose the recording method from Relay Recording, Backup Recording or Allocation Recording. In Relay Recording, the data will be written on the SD Memory Card in the second slot when the SD Memory Card in the first slot is full. The content will be written in both SD Memory Cards in the first and second slot simultaneously in Backup Recording. In Allocation Recording, data is automatically allocated to the SD Memory Card in the designated slot by the type of content – RAW, JPEG, 6K PHOTO / 4K PHOTO, or 4K video data. For example, users can store only photos on the SD Memory Card in slot 1 and videos in slot 2. Moreover, both slots are equipped with access lamps so users can tell which SD Memory Card is underwriting and which can be ejected at a glance. Adopting a static-type touch control system, the 3.0-inch free-angle rear monitor in 3:2 aspect with 1,040K-dot high resolution features approx.100% field of view. It uses a pixel structure of RGB (Red / Green / Blue) and White to feature even higher visibility in sunny outdoor scenes. It tilts up and down by approx.270-degrees which makes shooting at either high or low angles even easier. Night mode can also be applied to the display on the rear monitor. For the Wi-Fi, 5GHz (IEEE802.11ac) is effective in addition to the conventional 2.4GHz (IEEE802.11b/g/n. This provides a secure and stable connection not only with a smartphone/tablet but also with other devices on location for smooth remote control. Transmission speed of photo/video data is also increased up by using the 5GHz-band*.